Pruning a tree refers to removing specific branches or stems, generally those that are diseased, damaged or dead. It’s the most common tree maintenance procedure, but it’s still one that involves careful knowledge and diligence. Improper pruning techniques can cause long-lasting or fatal damage. Since each tree responds differently to pruning, a little experience in this department goes a long way, which is why many homeowners choose to consult a certified arborist. What are the Reasons for Pruning Mature Trees? Routine pruning, such as that to remove diseased or damaged branches, can be done at any time. It’s very low-stress on the tree, so you can easily maintain your trees on an as needed basis. If pruning takes place in early spring, you have the added benefit of fast wound closure and maximized growth. Heavy pruning just after spring growth should be avoided since the tree just expended a lot of energy and can be easily stressed. Additionally, you should also avoid pruning certain species of trees during active transmission periods when spores can easily be spread from one tree to the next. This opens up a doorway to potential infestations. At first, pruning may be a bit intimidating, but remember that it’s for the better health of the tree. Pruning cuts should be made right outside the branch collar since this part of the tree contains healthy tissues that should not be damaged. Even if the trunk collar has grown from a dead limb, you should still cut just beyond the collar. For large limbs, the best approach is the three-cut method since you need to reduce the weight of the limb. Basically, you cut three times: an undercut, a second cut from the top and the removal of the stub. 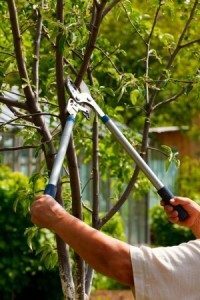 For your first time pruning, it’s best to work with a certified arborist who can show you the best techniques for pruning branches of all shapes and sizes. A certified arborist is necessary when pruning large trees or using power equipment. Cleaning: Removing dead, diseased, damaged, overcrowded and low-vigor branches. Thinning: Removing select branches to increase light and air entering the tree. Aesthetics: Removing select branches to strengthen the structure of the tree and allow it to resume its natural shape. Raising: Eliminating lower branches in order to provide clearance for vehicles, pedestrians and buildings. Reduction: Reducing the size of the tree, generally to make room for things such as utility lines. Perhaps the most common mistake when pruning trees is taking too much off. Proportion is key, so remember to keep the tree stable when pruning foliage and small branches. Otherwise, you could end up with too much weight on one side of the tree, or you could overthin the tree. Another mistake is creating an accidental wound. A tree will recover faster from several small wounds rather than one large one, so treat a severe wound with immediate care and concern. Unfortunately, wound dressings have been shown to have little positive effect on a wound, so your best bet is to let the injury heal naturally. Also keep in mind that the older a tree is, the less energy it has to repair wounds or defend itself from infestations. That means it’s your job to ensure that pruning is done correctly. Mature trees need to be pruned much less than young ones, and a rule of thumb is to never remove more than one-quarter of the tree’s leaf-bearing crown. In most cases, pruning with mature trees is limited to health and safety reasons for the tree or suburban location.